I love peanut butter, haven’t I mentioned that enough times already? Well even if I have I will say that again, I LOVE peanut butter. I can keep eating it all day and still not get bored of it. 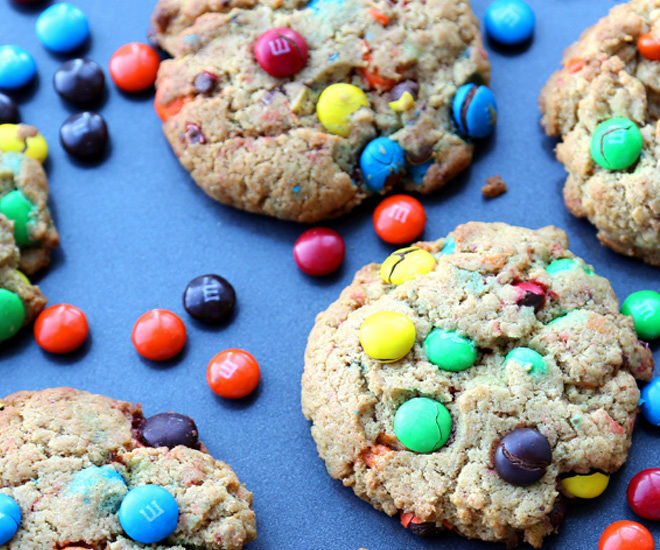 And what happens when you add M&Ms to it, well the combination becomes simply irresistible! I mean look at this. Can you resist this? I doubt! 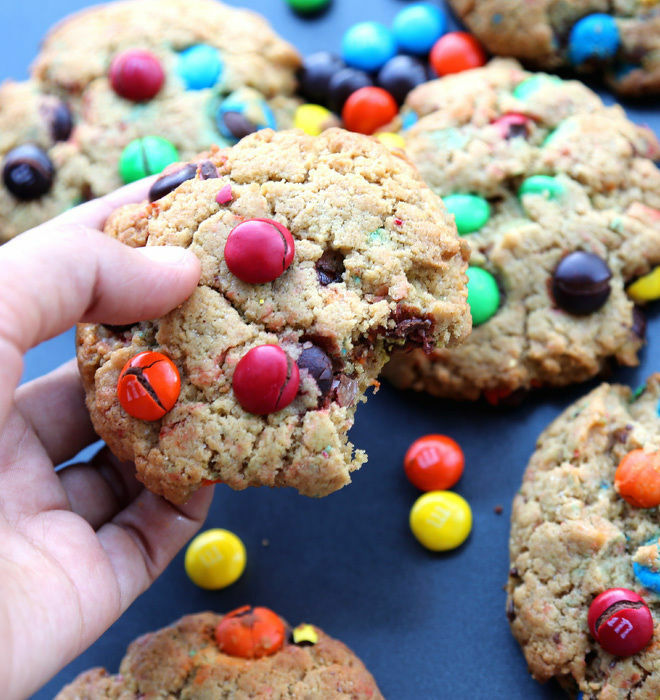 These cookies are so yummy, I bet you can’t just eat one. I ate 2 while clicking pictures and mind you they aren’t small, these are big cookies still my tummy wants some more! 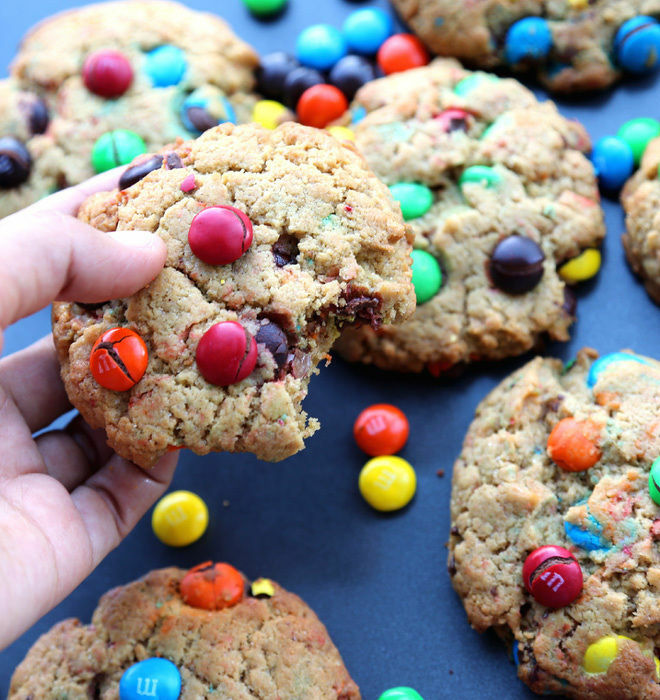 You know there are times when you all you want is a cookie, well next time you feel like that, bake these peanut butter and m&m cookies. 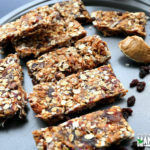 They are soft, gooey and full of peanut butter. What’s not to love? See I told you I ate them while clicking pictures. Some people like really sweet cookies, some do not. The sugar in these cookies was just fine for me but it might be a little less sweet for people who like sweeter cookies. 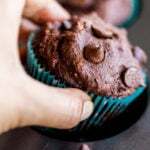 So if you are one of those, increase the amount of sugar in the recipe. I would suggest using 1/2 cup granulated sugar in stead of what is mentioned. A point about peanut butter, I used creamy peanut butter but I think chunky will also work well. Also, I used regular M&Ms but to enhance the peanut flavor, you can very well use peanut butter M&Ms. I have used a big cookie scoop here, these are the standard American size cookies, you can make them smaller if you want. 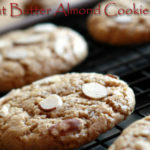 Enjoy these cookies with a glass of milk! 1. Mix together flour, salt, baking soda and baking powder. Set aside. 2. In the steel bowl of your stand mixer or using your hand mixer, cream together butter and peanut butter until smooth and creamy. 3. Beat in the granulated sugar and brown sugar. Mix for around 2 minutes, scrapping down the sides as required. 4. Add the vanilla, egg and mix. 5. Add the flour mixture to the butter-sugar mixture and mix until combined. 6. Fold in the M&Ms. 7. Take around 2-3 tbsp of the cookie dough, roll it into a ball and then flatten it a bit. 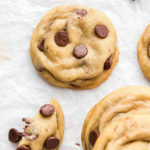 Place the cookie dough on baking sheets, leaving around 2 inches between each cookie. You can also use a large cookie scoop here. 8. Bake at 350 F degrees for around 13 minutes. 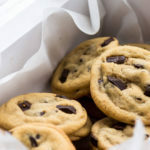 Bake for around 9-10 minutes for softer cookies, bake more for crispier cookies. 9. Place the cookies for wire rack to cool completely. * Adjust the sugar according to your taste. This was fine for me but if you love sweet cookies, add some more sugar. 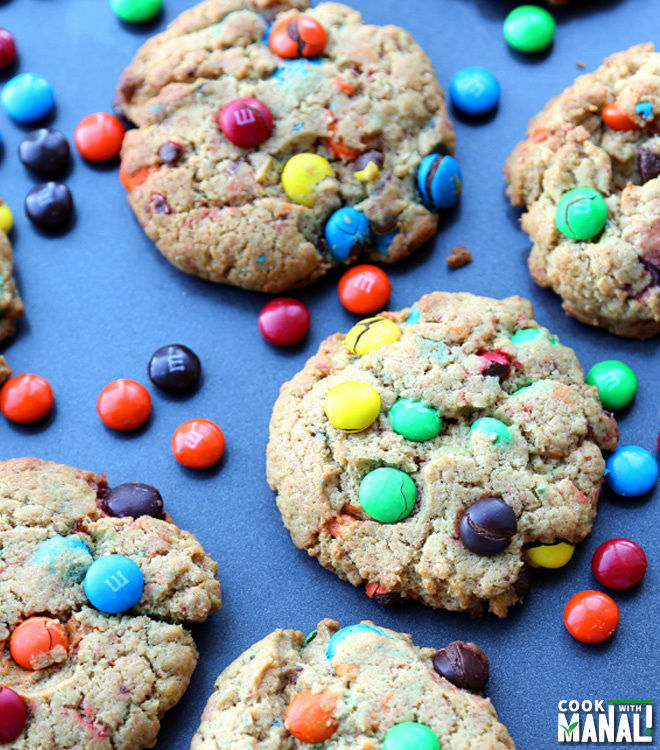 * Use peanut butter M&Ms to enhance the peanut flavor. * I baked these cookies for 13 minutes, you can bake them for around 9-10 minutes for softer cookies. 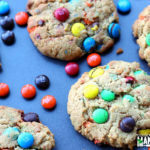 Irresistible cookies made with peanut butter and M&M candies! Mix together flour, salt, baking soda and baking powder. Set aside. In the steel bowl of your stand mixer or using your hand mixer, cream together butter and peanut butter until smooth and creamy. Beat in the granulated sugar and brown sugar. Mix for around 2 minutes, scrapping down the sides as required. Add the vanilla, egg and mix. Add the flour mixture to the butter-sugar mixture and mix until combined. 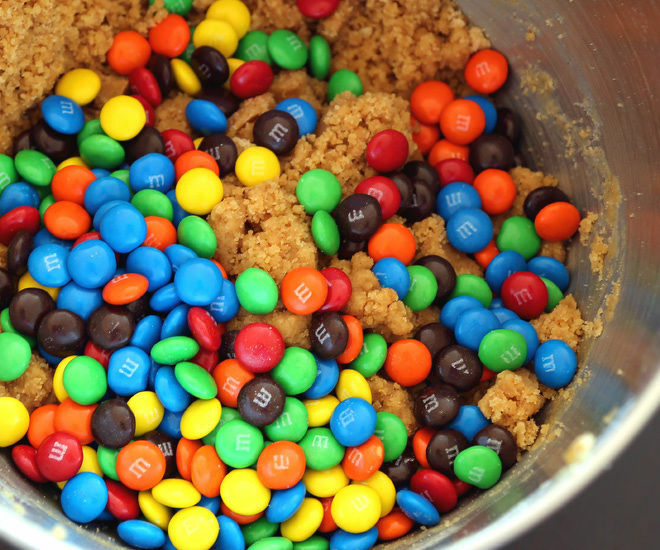 Fold in the M&Ms and stir till it's well incorporated in the mixture. Take around 2-3 tbsp of the cookie dough, roll it into a ball and then flatten it a bit using your hands. Place the cookie dough on baking sheets, leaving around 2 inches between each cookie. Bake at 350 F degrees for around 13 minutes. Place the cookies for wire rack to cool completely. 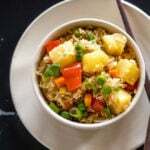 Bringing you easy, delicious vegetarian & vegan recipes! Eating veggies can be fun, you just need to get creative in the kitchen with the right set of ingredients! 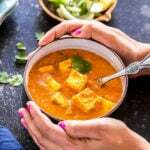 Get free, easy and delicious vegetarian recipes delivered straight to your inbox! 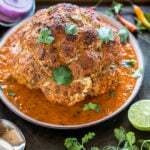 Whether it’s your favorite Indian takeout or the regular lentils and beans, these 75 new recipes will show you how easy it is to cook your favorite Indian meal in the Instant Pot.